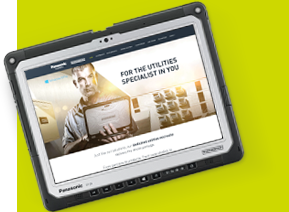 Here at Panasonic TOUGHBOOK, we’ve worked closely with the best of the best in utilities for decades, to truly understand the unique challenges you face. So that we can deliver the perfect rugged and tailored mobile computing solutions for your sector. ​In short, they need superior reliability, seamless flexibility and uncompromising performance. Looking for the complete utilities package? For information on partners and products. For case studies and industry reports. For TCO insight and custom design direction. Visit our comprehensive utilities microsite for the full picture. repairs due to physical damage in the last 12 months. From wireless intelligence and security to productivity-enhancing technology and the ‘Connected Vehicle’, our durable handhelds and supporting services are helping to drive on-the-go efficiency for the utilities sector in ways never before possible. tailored to your exact needs?